Compact & delicate: this is what the new Trinity Alpha is made up of, a square box with a smart response system, resin decoration panels, unique pod structure, etc. It&apos;s a small but exquisite vape partner that you can take along with whenever you want, wherever you go. 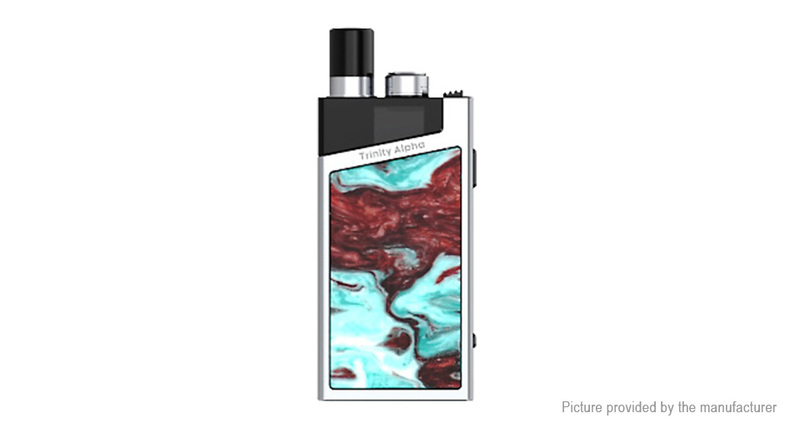 Three modes for better vaping pleasure: the power range of Trinity Alpha is between 10 watts and 25 watts, and it has three modes to satisfy different vaping demands —S(Soft)/N(Norm)/H(Hard). You can switch to your desired power output mode by pressing the Mode Button, and meanwhile, the corresponding LED light will be on. Atomizer ring: the stainless steel atomizer ring is placed on the upper part of the pod where the drip tip is inserted into, and it&apos;s also functioned as a decorative ring. In addition, the drip tip is removable and replaceable, and you can use other 510 drip tips to replace the original one.